This is a great dessert for adults and kids. Prepare the terrine mould by lining it with cling film. Warm up the apple juice in a small pan and add the sugar, when the sugar has dissolved remove from the heat and add the gelatine. 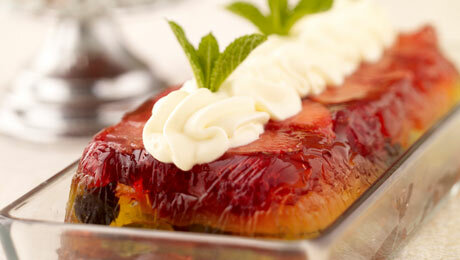 Add the first layer of fruit (strawberry slices) to the base of the terrine. This will be the top layer when removed from the terrine. Next pour over a little of the gelatine syrup and place in the fridge for 10–15 minutes. Repeat the process for each layer of fruit and finally place in the fridge to set, for at least 4 hours, but preferably overnight. Serve with lightly whipped cream or ice-cream.